Are you looking take full advantage of the newly improved USB Version 3.0 that is PCI-E compatible? SupaHub oﬀers top solutions for keeping your computing performance up-to-date, and the best it can be. -Hot-swapping feature allows you to connect/disconnect devices without powering down the system. - This PCIE card is only compatible with standard-sized tower cases (not mini computers). 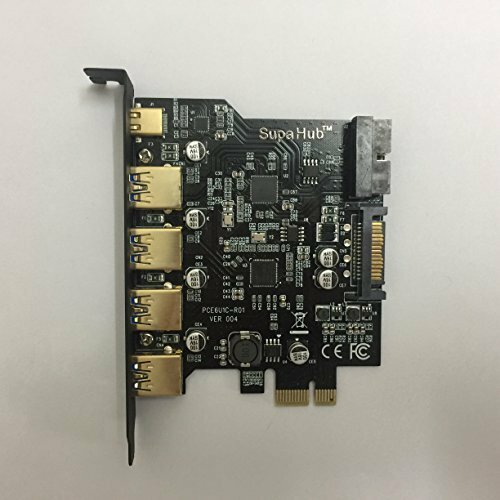 - To ensure sufcient power supply and smooth transfers, particularly for large data transfers, it is necessary to connect the card to the PC power supply with the enclosed 4 pin Molex to SATA converter. - Please make sure the power cable strand colors match each other when connecting to the power augmentation, as to avoid faulty currents. - Actual speeds limited by setting of the device connected. - This card is not compatible with the Oculus Rif and Kinect 2. INCREASE YOUR USB SPEED 10X! Your new PCIE USB 3.0 Expansion Card will support SuperSpeed USB 3.0 transfer rates up to 5Gbps. USB 2.0 delivered a maximum of only 480 Mbit/s. Backwards compatible with USB 2.0 and 1.1 devices.